If you are having trouble with any of your equipment we are here to help. We have the knowledge to tackle any pool problem and will let you know the right way to fix it. Don’t waste your time guessing what the problem is, let a pool professional diagnose the problem so that you get the repair done and have your pool back up and running quickly. 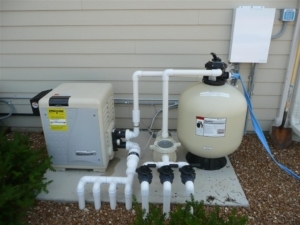 We can service and repair almost any pump, filter, heater, or heat pump on the market. Let one of our techs diagnose the problem and quote you a price to repair. If your equipment cannot be repaired we can quote prices to replace with the latest version of your equipment and can get it installed quickly. Are you a new pool owner or are you just wanting to make sure you’re operating your pool safely? Consider having a tech come to your home and do a Pool School. In just an hour or two we can go over how to use your pool equipment properly, setup your automation or phone apps, teach you about chemistry, and more. You can never have enough knowledge about your pool, a Pool School is a great start. Is your automatic pool cleaner sitting in the corner collecting dust and not at the bottom of your pool doing it’s job. We can help, let our pool technician diagnose the problem and we can let you know what is wrong and what parts are needed to fix it. We can also order parts for nearly all of the cleaners on the market. Regular Service Visit Rate After 1st Hr.